The day before yesterday I made a Carnitas Recipe from Mark’s Daily Apple. I cooked it in the Crockpot for about six hours on high. I wanted to make it more crispy by putting it in the oven, but fabulous husband and I were starving and I quickly made a taco salad with it. MMMM. Then tonight, on the stove, I heated up the leftovers (which had been crispified the night before in the oven while we ate the salad). I added some olive oil and PicoPica Taco sauce (it has some iffy ingredients, but we love this stuff!). 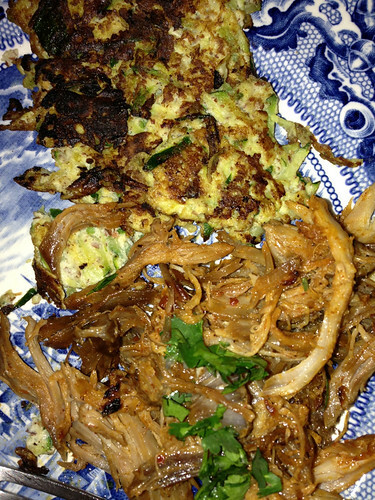 Then I made Zucchini Fritters to go with the Carnitas. Fry up until crispy on both sides. I ate mine with no sauce, fh (fabulous husband) put organic ketchup on his. Yum.